Just 157km of timed Special Stage separates Spaniard Marc Coma from his fourth Dakar title after another solid performance on the penultimate stage of this years race. The factory KTM man now has a massive 1h 59m lead after his closest rival Joan Barreda ruled himself out of contention with a crash and subsequent technical problems. It was another impressive performance by five time Dakar winner Cyril Despres. Although he is out of contention for the overall win following technical problems earlier in the race, his form in the second part has been stunning. The factory Yamaha man took his second stage win of the race and as a result moves up into fourth position – just 15m off of a potential podium finish. While it was all smiles for both Coma and Despres it was a disaster for HRC rider Joan Barreda who saw his dreams of a Dakar finish end. 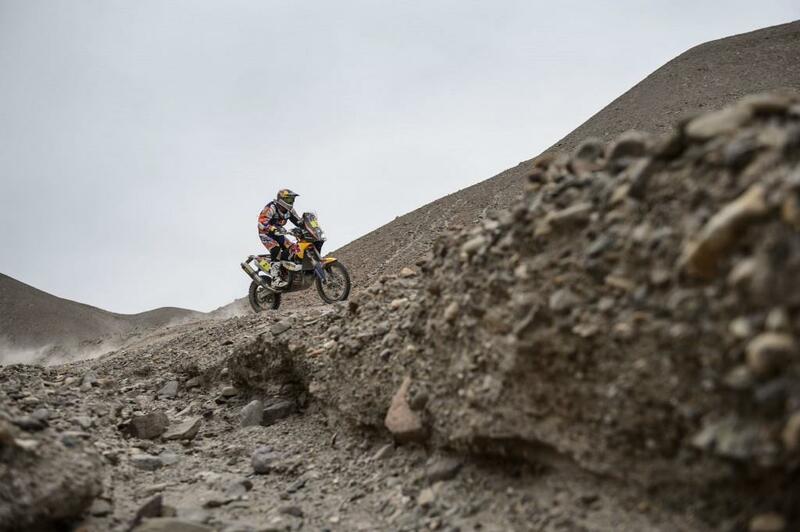 Barreda has been a front runner from the start of the race having won four stages, but a heavy crash and subsequent major technical problems means he lost a massive 2h 29m, finishing 67th on the stage. The devastating result sees him drop from a comfortable second position overall down to seventh in the standings. Second overall is now in the capable hands of factory KTM rider Jordi Viladoms. The Spaniard was drafted in as a support rider to Coma following the untimely death of Kurt Casseli and has fulfilled his role faultlessly, giving support while looking set to make it a 1 – 2 for KTM. Villadoms said: “You can never say it's over when there is still a special to be ridden. There are still a fair amount of kilometres to be covered… But it's obvious that I'm very happy with what I've done up until now. As for Joan [Barreda] I don't know where he is. I saw him repairing on the side of the tracks and I don't know if he will be able to finish in time… we'll see. For the moment, I'm third and tomorrow anything can still happen. In any case, I'm very happy with the work that all the team has put in. If we can improve on our position, then it's a bonus and so much the better!"